Home Tags Posts tagged with "keeping our device safe"
Although there are multiple travel adaptors which are designed with single use for protecting electronics from power surges and overloads, but replacing them and lugging spares around can be a hassle. 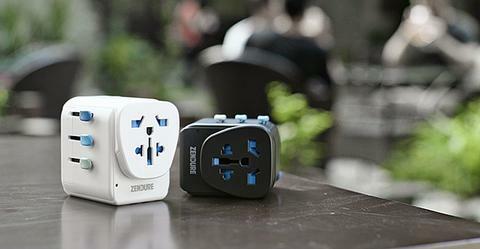 In order to fulfil this inconvenience, Zendure has launched Passport Pro which is the world’s first travel adaptor with an auto resetting fuse. It is the device for many those travellers who eagerly eye their adaptors while charging and not sure how far they can push the charging capabilities. This adapter can be reset up to 10,000 times that will extend the life of the adapter ever further. In this device, a resettable circuit breaker has been introduced as the traditional circuit breakers are too big and too expensive for travel adaptor. For finding a perfect circuit breaker which is small enough for fitting into Passport Pro, the top priority is keeping electricity grounded in the electrical safety. Its ground wire plays an important role but surprisingly, most of the travel adaptors available in the market do not have a ground connection. Passport Pro has four plugs and each is equipped with the ground connection. Ground wire is the essential safety feature in any electrical system. In case of high voltage, short or irregular electrical current, these ground wires provide a path for the electricity as well as transfer energy to the ground instead of electrical systems. This is helpful in keeping our device safe as well as reduces the risk of electrical shock and fires and other dangers.